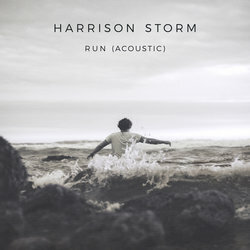 In the wake of the release of his latest single 'Run' - Harrison Storm, has been going from strength to strength. The track which has amassed over three hundred and fifty thousand streams in a month, has been followed up with an amazing video clip from Anna Phillips, Sam Brumby and Jamie Croft, and stars Australian actor: Jeremy Lindsay Taylor (Sea Patrol, Puberty Blues and Heartbreak High). Now he is continuing the trajectory with the release of an acoustic version of ‘Run’. This version pulls back on the instrumentation of the original, but maintains the raw emotion which makes the track so instantly endearing.